I'm so excited to share with you the start of the ON YOUR MARK...CREATE! HOP. We have some wonderfully creative people on board for the hop and you won't want to miss what they've come up with. Everyone is using the same fat quarter bundle of my On Your Mark fabric for Paintbrush Studios. Each day one of our talented designers will give away a fat quarter bundle. Just leave a comment on their page to be entered into their drawing. If you miss the drawing you can purchase the bundle here. Here's a list of my friends and our schedule. A while ago I saw a sad looking chair with awesome potential at my friend's yard sale. The fabric was worn with plenty of holes. One corner of the seat back was wobbly. I could tell it desperately needed a new seat cushion and new webbing in the back. I could hear it whisper to me...."Take me home and give me a make over with your magic, uh... I mean fabric." So I did a lot of overthinking and planning and cutting and sewing and more sewing and planning and upholstering. I even used my grandparents old-school upholstering hammer and tacks. After a week I had this sweet treasure on my hands. Here's a few process images of the clean part of the project. 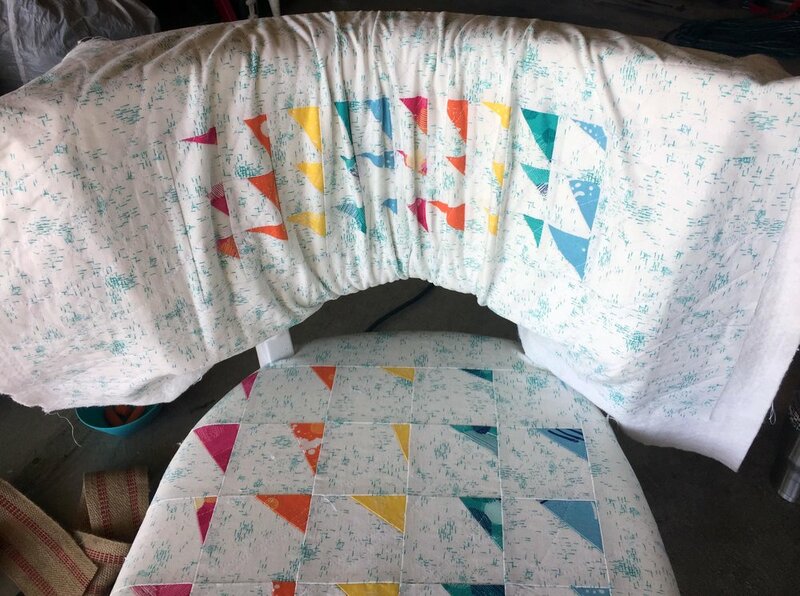 The images below show how I prepared the fabric to become the seat cushion and seat back. In a future blog post I'll show how incredibly messy is was to remove the old upholstery tacks, fabric and dilapidated seat cushion. The seat cushion fell apart and turned to dust as I was removing it. WHAT A MESS!!!!! Doesn't this look easy? 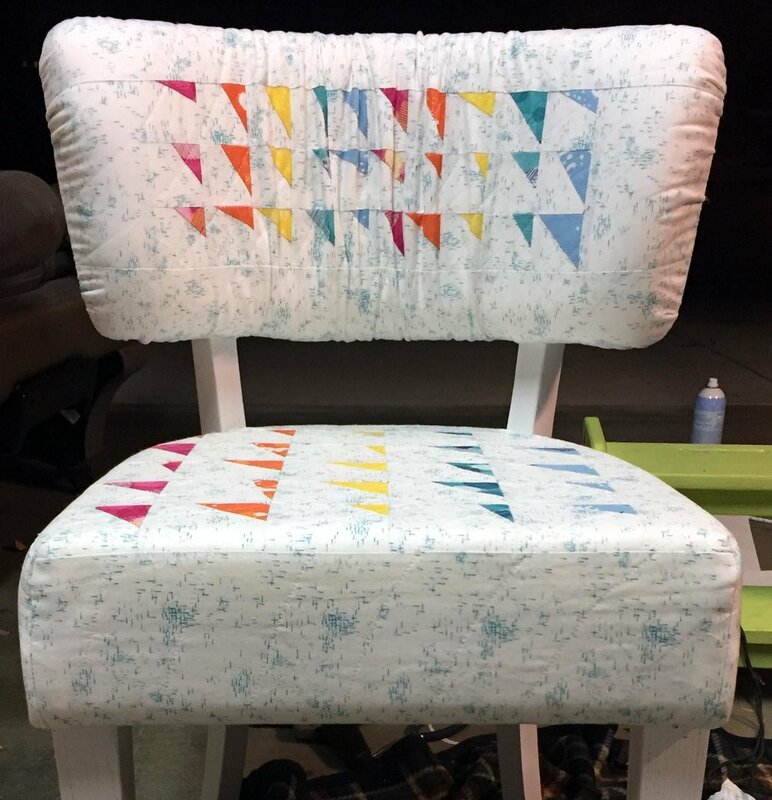 Just sew up some squares and improv triangles and wrap them around a seat cushion. HA! How to properly use an electric carving knife. And finally a few glamour shots of the final improv triangle chair. And yes, here is my grandparent's upholstery hammer. I've got a small tool chest full of hand-me-down upholstery supplies. I'll have to show you more pictures of all the tools another time. Hope you've enjoyed the project. Leave a comment on my blog or IG feed to enter the drawing for a free fat quarter bundle. Check out what all my awesome designer peeps are doing for the next 9 days.